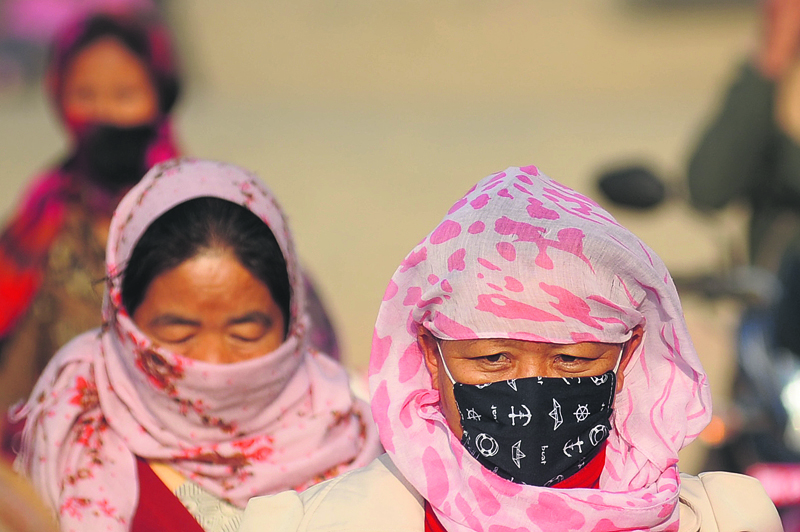 Republica Women with their faces covered with face mask and shawl in Kathmandu in this recent photo. The pipe-laying work of the Melamchi Drinking Water project has aggravated the dust problem in Kathmandu. Studies have shown that cheap cloth masks are ineffective. KATHMANDU, Feb 23: Mina Gaha, a 49-year-old from Tansen, Palpa district came to Kathmandu for her child's medical treatment four days ago. Gaha now feels suffocated, with throat and chest pains and coughing. “I use a cloth mask throughout the day, believing it would help,” she told Republica while walking on a road near Singh Durbar. Bidur Subedi, a student at Bishwa Bhasha Campus, has been using an ordinary cloth mask for the last six years. “I always use a mask when I leave home but I am not aware if it has been effective,” he said. 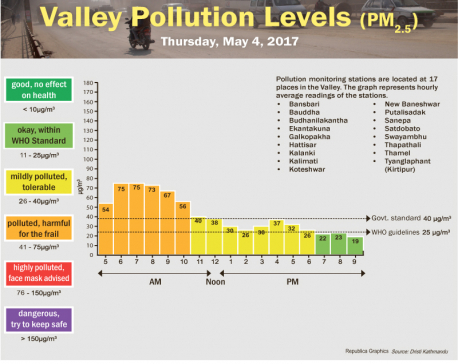 Kathmandu Valley air quality is impacted by dust, soot and emissions from use of non unleaded petrol and diesel. 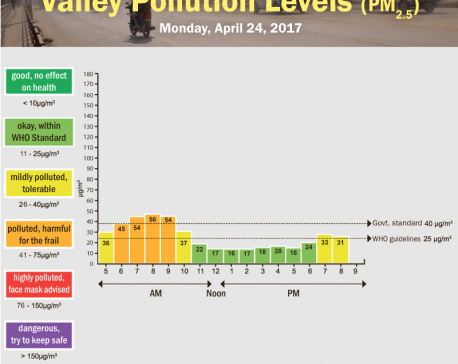 By way of comparison, a poor air quality day in the US city of Los Angeles may see 100 micrograms of particulates per cubic meter (PM10), while the level in Kathmandu can be 800-900, according to a recent study carried out by environmental health scientists at the University of Massachusetts, Amherst. The results of a new study done in Nepal suggest that inexpensive cloth masks worn by people who hope to reduce their exposure to air pollution vary widely in effectiveness and could be giving users a false sense of security, especially in highly polluted localities. The researchers tested for several variables and effectiveness in filtering out five different synthetic aerosol particle sizes, and three particle sizes of diluted diesel exhaust, which simulated real-world conditions. The abstract of the study titled 'Evaluating the efficacy of cloth face masks in reducing particulate matter exposure' says inexpensive cloth masks are widely used in developing countries to protect from particulate pollution. But only limited data on their efficacy exists. The study appeared in the Journal of Exposure Science and Environmental Epidemiology. The study concentrated on four types of masks--three types of cloth masks and a type of surgical mask-- commonly worn in the developing world. Among the cloth masks, a type with an exhaust valve performed best with a filtration efficiency of 80-90 percent for the measured polystyrene latex (PSL). The other two types of commercially available fabric masks were the least effective, with a filtration efficiency of 39-65 percent for PSL particles. But they performed better as the particle size increased, according to Dr. Kabindra Man Shakya, one of the researchers. “Standard N95 mask performance was used as a control to compare the results with cloth masks, and our results suggest cloth masks are only marginally beneficial in protecting individuals from particles smaller than 2.5 micrometers, often considered more harmful than larger particles because they can penetrate the lungs more deeply. Compared with cloth masks, disposable surgical masks are more effective in reducing particulate exposure,” the researchers said. While the standard industrial hygiene mask known as N95 is well tested, such masks are not readily available in most developing countries, and would be too expensive for most consumers. “Unfortunately, the least effective two mask types are inexpensive, reusable and widely used in developing countries,” the researchers note. They found that mask shape and ability to mold to the face boosted effectiveness. The cone-shaped cloth masks and snug-fitting surgical masks performed better than looser-fitting masks. Dr. Khem Bahadur Karki, member-secretary at Nepal Health Research Council, said that the masks available in the market are unsafe and ineffective against pollutant particles. “They can cause severe harm in human health, affecting lungs and blood circulation,” he said. Dr Karki informed that air pollution causes 72 percent of risk for cardiovascular diseases and stroke, 14 percent for lung damage and 14 percent for cancer.